In some ways, the “Dooku Captured” / “The Gungan General” two-parter can be considered a bit narratively slighter than some of the previous arcs, mostly because our characters don’t actually end up accomplishing much. Their main goal of capturing Dooku is a failure. With that said, there is still greatness to be had in these 40 minutes, as well as some wonderful character moments and plot twists. Perhaps more so than any Clone Wars episodes before them, this duology pays great tribute to the 1940s action-adventure B-movie serials that were one of Lucas’ early influences on Star Wars, particularly “Dooku Captured”. 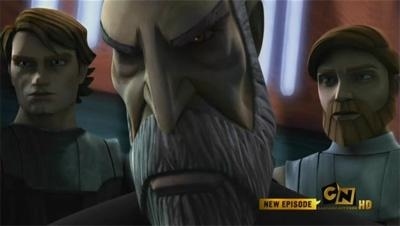 Many–arguably all–episodes of the series begin in media res, but few thus far have done so quite to the extent of “Dooku Captured,” in which the “news announcer” recaps so many past events we hadn’t seen, I double-checked to make sure I hadn’t skipped an episode. Before the episode proper begins, we learn that Obi-Wan and Anakin had tried to track down Dooku, that Anakin had been captured, and that Obi-Wan was launching a one-man rescue mission. Eventually, we discover that the reason that these early bits weren’t shown on screen was in order to conceal the fact that Anakin’s kidnapping had been part of Obi-Wan and his plan to capture Dooku. On another level, however, it also pays tribute to the perpetually-serialized nature of the stories the episode riffs on. As in any classic serial, the Bad Guy (TM) eludes capture in a fantastic manner, and our heroes rush off in pursuit, where they then get caught in a dark, dank cave. Dooku traps them inside, underneath heavy rocks, making off with Anakin’s lightsaber. Meanwhile, Obi-Wan’s is badly damaged, leaving the two with nothing but their Force powers to protect them against monstrous, bat-like creatures and eventually, poisonous gas. While previous episodes had given us tight but all-too-brief interactions between Anakin and Obi-Wan, this two-parter gives us more alone time with our bickering duo, and as usual, all of their moments together are absolutely superb. As I’ve noted before, the show never fails to demonstrate the love underneath the squabbling, which also never feels petty due to Obi-Wan’s sparkling wit and Anakin’s quick response time. The give and take is both funny and lovely, and although some of it is built on a bit of actual resentment–Anakin truly is annoyed that he still isn’t a full Master, and Obi-Wan does get annoyed that Anakin never listens to him–they manage to mask it with good-natured ribbing. Basically, this episode is an old-fashioned action-adventure buddy comedy, and I love it for that. I also love how they both react to Ahsoka ultimately rescuing them, with neither being able to admit that they didn’t have the situation under control. Even with that, though, this isn’t general Jedi arrogance. They have a sense of humor about it. As does the episode. Where Anakin, Obi-Wan, and basically the entire Republic army repeatedly fail, a bunch of space pirates succeed. After all of that epic sturm und drang spread out over the course of the series to date, not to mention Episode II, Dooku basically walks right into a group of the scoundrels, and they instantly capture him for ransom. And never does the Separatists’ reputation for double-crossing become more apparent than when even these criminals refuse to trust them to not wipe them off the face of their planet and instead decide to deal with the Republic–the typical irony being that little do they know that the Republic’s Chancellor is the very same man who commands the Separatists. 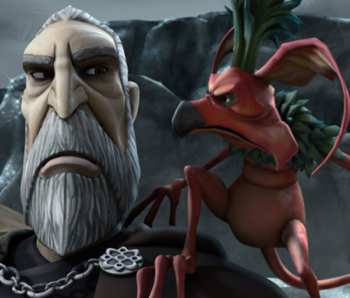 They negotiate for two Jedi–Obi-Wan and Anakin–to be allowed to visit their planet sans weapons (so again they have to make do without them) and confirm that they do, indeed, have Dooku. (And I also love Obi-Wan’s attitude here, that they should look at the pirates’ success where they have failed as a lesson in humility.) 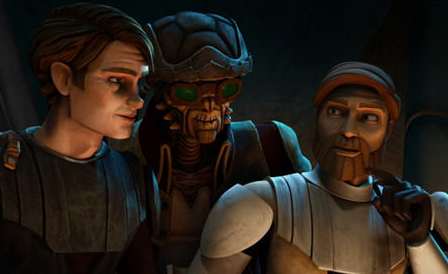 Of course, the pirates renege on this deal, as well, and capture our heroes for ransom along with Dooku, but then later on, this hive of scum and villainy lives up to its name, when the head pirate, Hondo, is betrayed by a group of his own people, who attempt to capture the Republic ship on which delegates such as Jar Jar have arrived to deliver the ransom, so that they can keep it for themselves. The Jar Jar portion of the second episode mostly reasserts the foolish/brave dichotomy that defines his character, as explored in “Bombad Jedi,” as here again we see his bravery in facing the pirates unarmed, and also how his klutziness can cause trouble–as when the Republic ship is being shot down–but can also be used advantageously, as when he accidentally turns the tables on the bad guys, inadvertently leading to a successful conclusion. The real meat of the episode, however, lies in the Obi-Wan/Anakin/Dooku scenes. Putting aside the episode’s seemingly awkward start (Obi-Wan and Anakin wake up in the cell, having been drugged, even though we clearly saw them swap the drugged drinks with those of the aliens sitting closest to them at the end of the previous episode, so it’s not clear whether this was a production error, or if the implication is meant to be that, while the Jedi were confident they had the upper hand, the cunning pirates actually found a different method of drugging them after all, perhaps with poisoned darts or something), this plot proceeds with terrific comedy between these three men, who are being forced to work together to survive. At times, the two Jedi and the Sith Lord are at each others’ throats, while at other times, the Sith Lord almost seems to be gaining the tiniest bit of respect for the two Jedi and vice versa, each one using their unique skills to aid in trying to escape. It is quite telling, however, that Dooku uses a knife–a weapon–to help them escape the first time (albeit not in a deadly fashion), whereas Obi-Wan simply uses his Jedi powers of Forcely persuasion. And in the end, once Dooku is ironically freed by Jar Jar taking out the power, all sense of comedy falls away from his behavior. He brutally Force-chokes one pirate, while compelling him to shoot another to death, before boarding a ship and escaping. In the end, once Jar Jar and Co. finally arrive to free Anakin and Obi-Wan once more, Hondo is shocked by the fact that the honorable Jedi don’t capture them, but Obi-Wan’s words of warning are apt: while they don’t seek revenge, the same can’t be said of Count Dooku, who is full of rage and Force lightning, and knows where they live. Gulp.